I first heard Tibetan musician Penpa Tsering perform at the 2008 Lowell Folk Festival. It wasn’t until November of 2014 that I made it out to Bedford, MA where he now resides, to interview him. 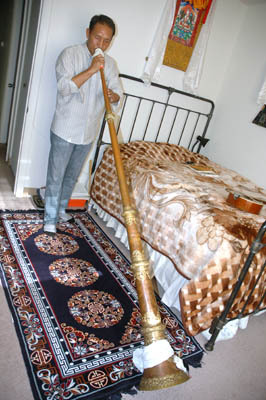 I knew that he made some of his own musical instruments and that he plays sixteen different instruments including the deling (flute), pi-wang (lute) and the impressively long brass trumpet, the dungchen. Born in Chamdo, Tibet in 1963, music filled Penpa Tsering’s life from an early age. His mother and grandfather taught him to sing traditional Tibetan songs, including the healing songs of his family, who, for generations, have been nomadic farmers. 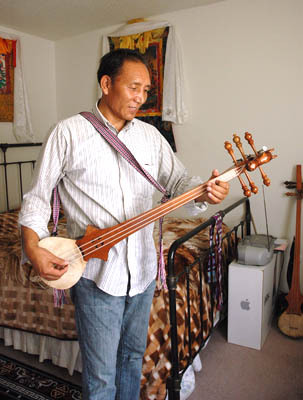 He claims to know over 70 Tibetan traditional songs, which are not well documented and at risk of being lost. Sometimes, interviews lead to other opportunities for artists. I was able to help connect Penpa with members of a Connecticut Tibetan community who were very interested in learning Tibetan songs, music, and dance. 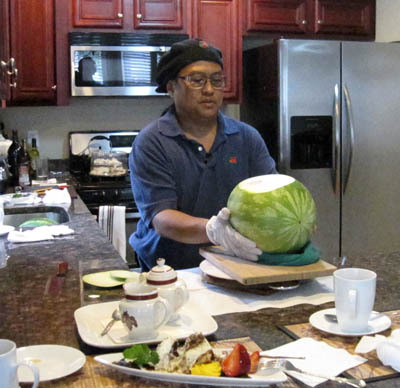 Their apprenticeship is currently underway, thanks to a grant from the Connecticut Cultural Heritage Arts Program. Penpa Tsering is not only passionate about sharing Tibetan culture through teaching, he is also eager to perform. So it was a pleasure to pass on his contact information to Bridget Lynch, Director of the Trustman Art Gallery at Simmons College. Anya had come across Penpa’s profile on our Keepers of Tradition website while looking for a performer to kick off a new “Music in the Gallery” series. Things fell into place and the upcoming event is one I look forward to attending. 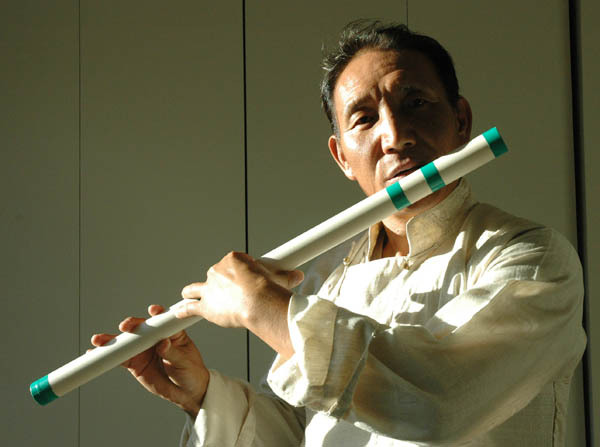 Dressed in traditional Tibetan clothing, Penpa will perform on a variety of musical instruments and sing traditional songs from his family’s repertoire. The concert/demo takes place on Tuesday April 7 from 2:00-3:15 pm at the Trustman Art Gallery, located on the fourth floor, Main College Building, 300 The Fenway in Boston. The concert is free and open to the public. For more info, contact Marcia Lomedico 617-521-2268. Continuing our paper tradition theme at this year’s Lowell Folk Festival craft area, we turn to architectural drawing and model making. 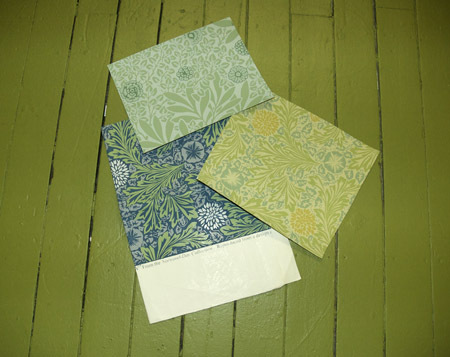 Paper is still the most common way of transmitting architectural information and ideas. From initial sketches to the iterative design process, from presentation to white prints, it is the drawing on paper that is critiqued, approved, and followed. 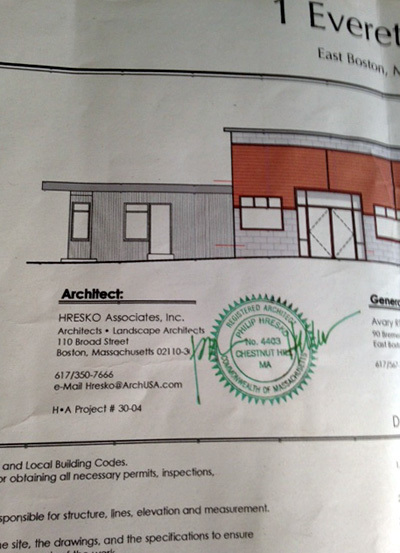 Architects need paper plans to get client approval or obtain a building permit. Contractors, engineers, and builders need a paper plan from which to work. 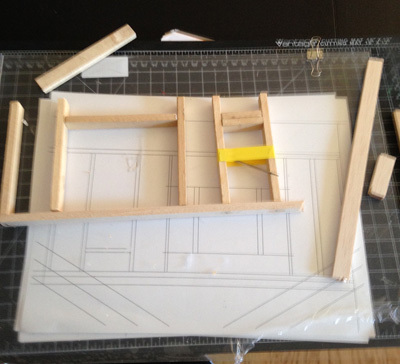 Architectural drawings (floor plans, sectionals, and elevations) might be perplexing to someone who doesn’t know how to “read” them, but with a 3-D representational scale model, no translation is necessary. 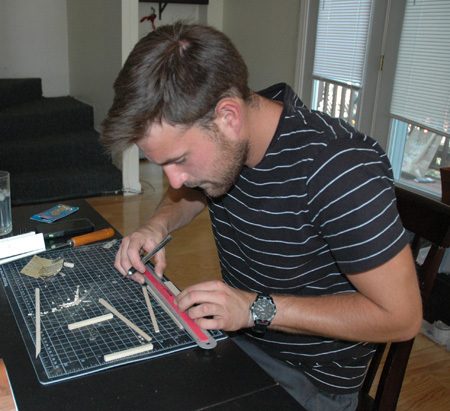 As a student at the Boston Architectural College, Russell Call is learning the essential skills of architectural drawing and model making. 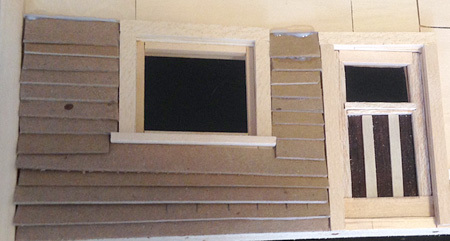 Paper is used to make massing models. 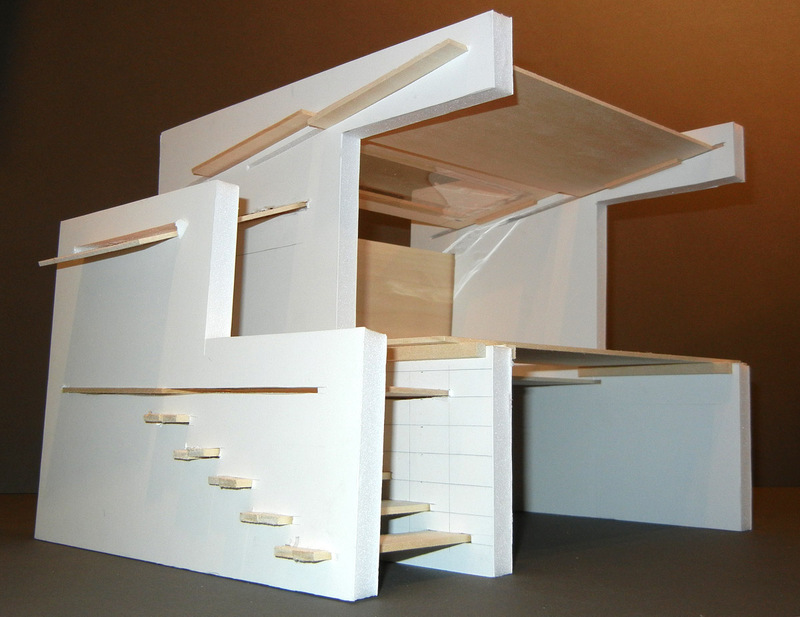 These rough study models can be made quickly and are an efficient tool for understanding how a design will occupy real space. Paper can also be easily modified to represent different types of building materials, e.g., flat paper for façade; stacked, compressed paper for cement; and folded paper for clapboard siding. In today’s digital world, with access to computer-aided-design (CAD), why do you think architects still build models out of paper? 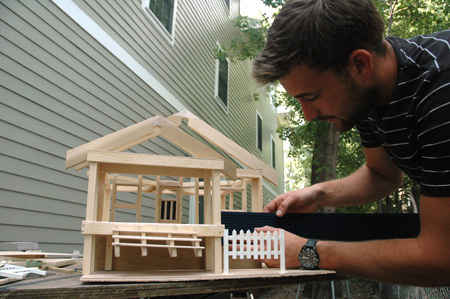 Building 3-D models out of light bass wood is a hands-on way of learning about construction methods –foundational support, structural integrity, joinery, framing, and finishing. 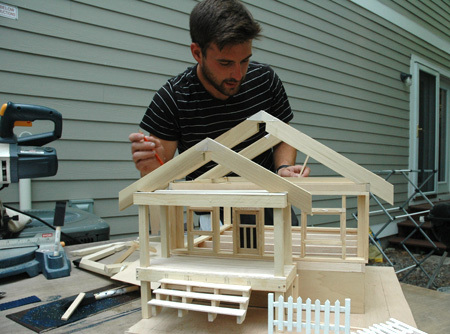 Come see this miniature bungalow-in-the-making, as well as other architectural paper drawings and models in the folk craft area of the Lowell Folk Festival. Perhaps you’ve tried breaking open a piñata at a birthday party, but did you know that this paper mache object has roots in religion? 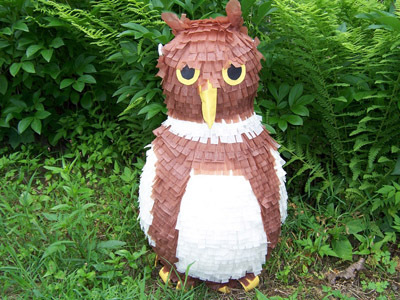 The Spanish brought the tradition of piñatas to Mexico, to help transmit Catholicism. Angelica Ortiz grew up in Mexico City. She remembers watching her uncles make piñatas each December. During the nine evenings of Advent, people gathered in the street holding candles to walk and sing songs of Las Posadas. 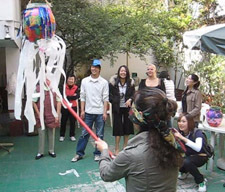 Each night, a different family hosted a party, ending with the breaking of a piñata. 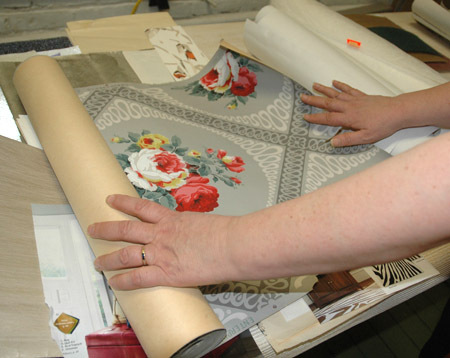 Susan Urban practices the Polish art of wycinanki (paper cut design). 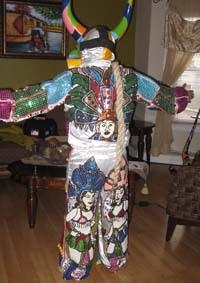 She also makes cut paper dolls wearing costumes from different regions of Poland. 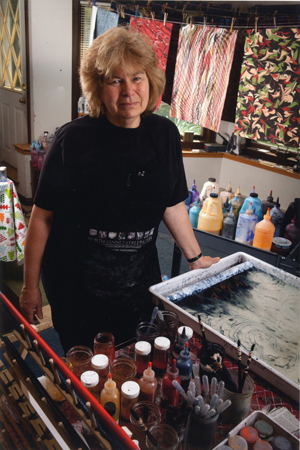 Generations of West Springfield school children have benefited from having her as their art teacher. Wycinanki are believed to have originated with Polish peasants. Farm women hung sheep skins over the window openings of their farmhouses as a way of keeping out the elements. In order to let in light and air, they used sheep shears to snip small openings in the skins. 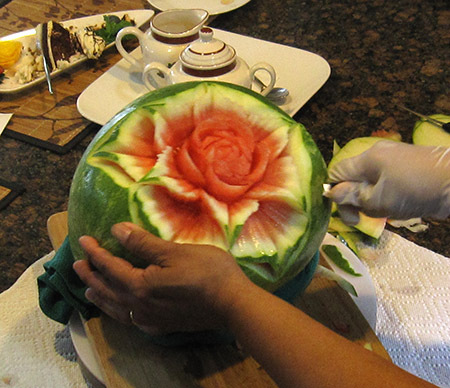 Like many folk arts, the practice was both functional and decorative. At some point, Polish women transferred their designs to paper. In Poland, wycinanki vary by region. 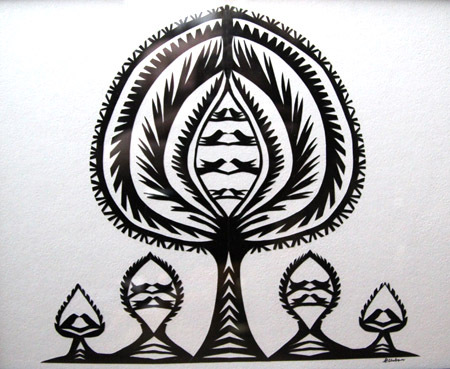 The women of Kurpie are famous for their paper cut-outs of animals, geometric designs, and flowers. These symmetrical designs are cut from a single piece of colored paper, folded once. Another style comes from the area of Lowicz and is distinguished by many layers of multi-colored paper. 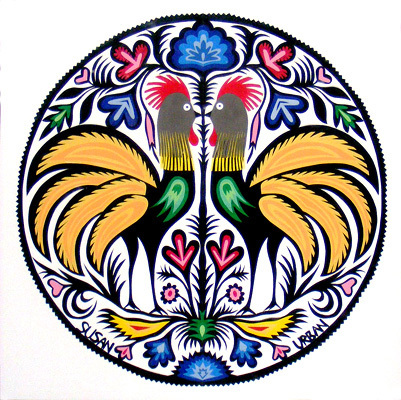 The native Polish rooster, which is black and noted for its strange-shaped tail feathers, is a popular subject for paper cutting. 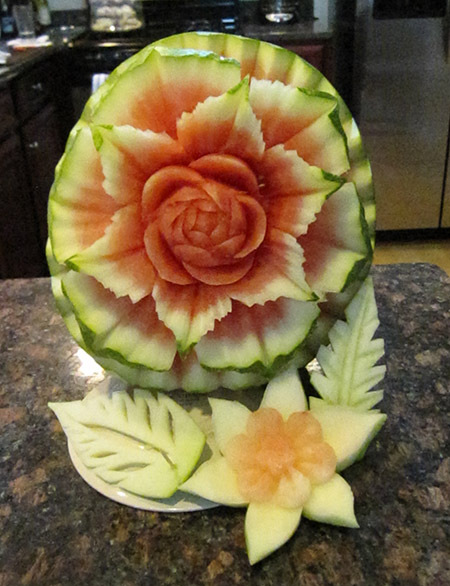 Some designs with repeated elements are made by folding the paper and cutting through as many as eight layers at a time. 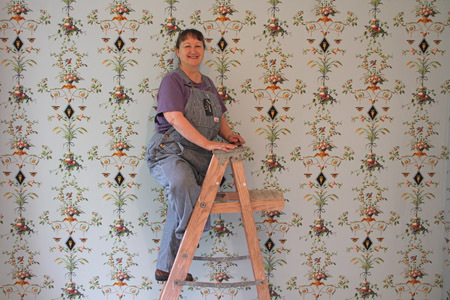 Susan Urban will be demonstrating the art of Polish papercut design in the folk craft area of the Lowell Folk Festival. Children have traditional ways of playing with each other: telling knock-knock jokes; playing store, tag, or make-believe; posing riddles; playing pranks; and creating playthings out of what is at hand. Some of the most commonly made folk toys are made of paper: fortune tellers (also known as cootie catchers), paper airplanes, spitballs shot through straws, and paper footballs scooted across the table just far enough to balance on the edge but not fall off. But no one officially teaches this kind of thing in school. In fact, it’s what kids do when the teacher isn’t looking. Children have been learning this type of amusement from each other on school playgrounds for generations. What’s remarkable is that these pastimes show such continuity and stability of form through time. Yet, everyone seems to outgrow them. Eleanor and Mary may be young teenagers, but they fondly remember the paper lore of their pre-adolescence. Fitting the Lowell Folk Festival craft area’s theme of paper, Eleanor and Mary are here to share their knowledge of making and playing with paper. 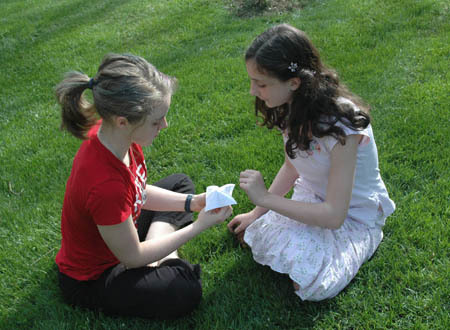 Come watch them fold a fortune teller, candy wrapper chain, or tissue paper flower. 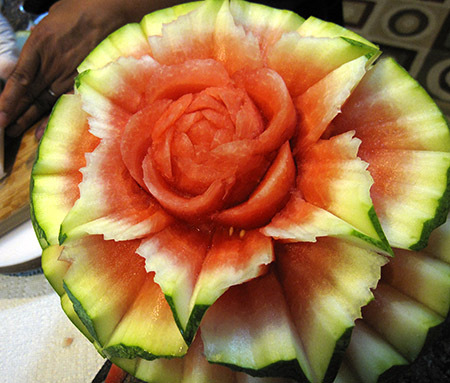 Or try your hand at making one of your own. Share what paper lore games you remember playing as a child. Genie and Dan St. John run Chena River Marblers in the Massachusetts’ Pioneer Valley, a region known for book arts. 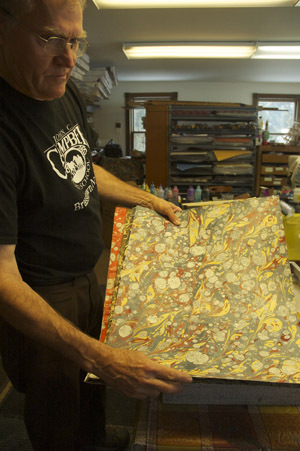 Working out of a home studio, they produce stunning marbled patterns on paper and silk. 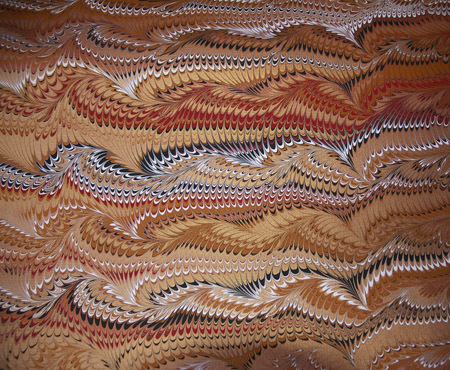 The marbled paper is used by book binders and paper artists, the silk in the making of scarves and ties. 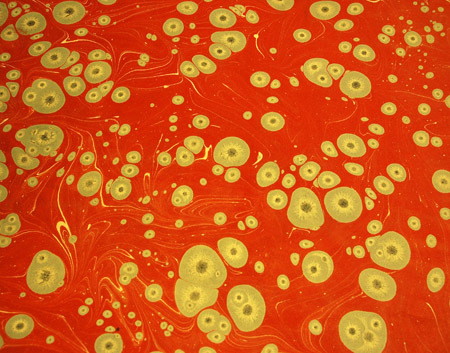 The process of marbling is almost magical. (fitting then, that Regina goes by the nickname “Genie”). 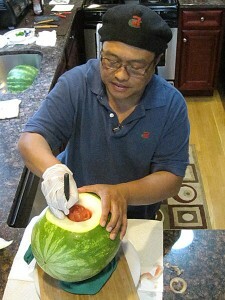 A bath of water and a thickening agent, such as carrageenan (dried seaweed) is prepared, onto which droplets of paint are applied. Genie explains that it is the thickened liquid that allows the paint to float on the surface. “You put all these colors on your bath and you manipulate them. 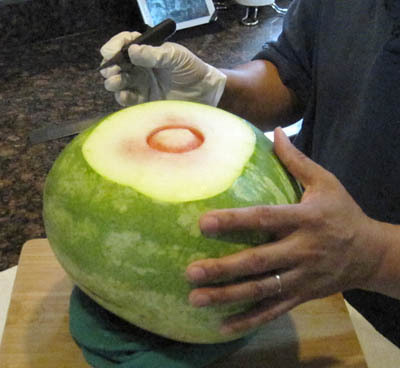 Comb them this way and that, and the colors don’t get mixed up. 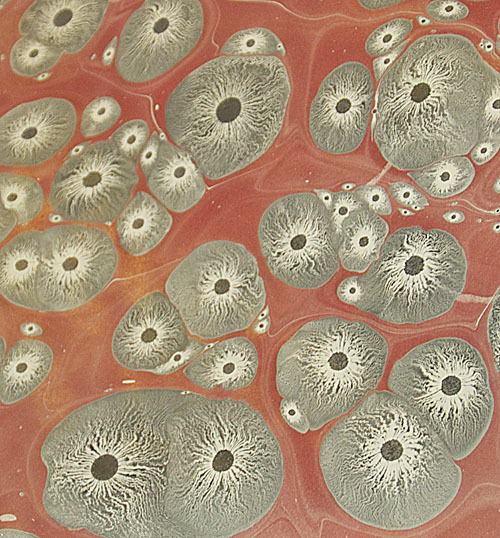 The pink stays pink, the white stays white, and you end up with these beautiful patterns right on the surface of your bath.” Next, the image is carefully transferred to an absorbent surface, such as paper or silk. 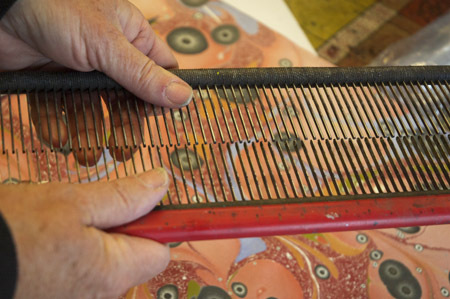 Dan builds much of the equipment, including the many different styles of combs, which when pulled through the bath, create unique patterns. Because no paint company manufactures colors specifically for marbling, Chena River Marblers create their own paints (grinding up pigments, adding binders, mulling them together), which allows them more control in how the paint will spread on the liquid surface. 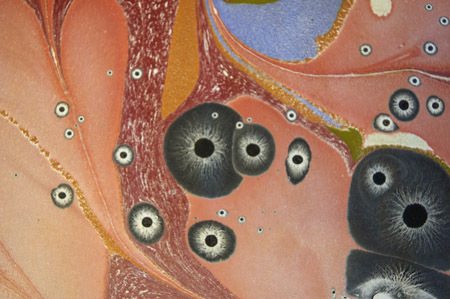 Dan favors the old style marbling; using watercolors, he creates what are called “tiger eyes.” Below are some examples which look like images from the natural world. 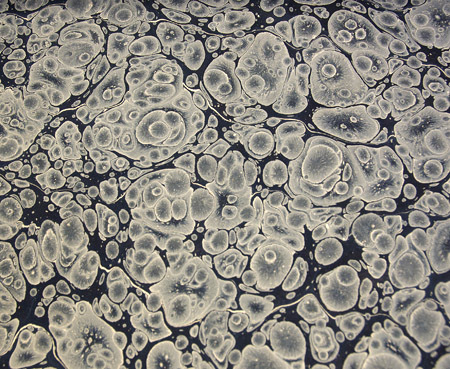 Another technique is called edge marbling, which was more commonly used in the production of 18th and 19th century books. 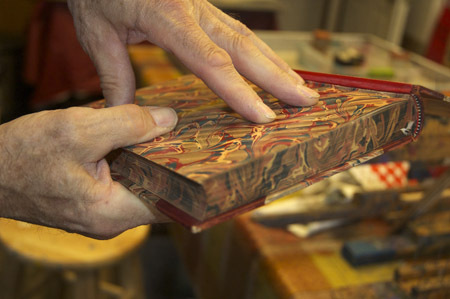 With marbled edges and end sheets, a book would end up looking like a piece of marble. 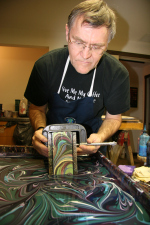 Together, Genie and Dan St. John convey a passion for the marbling craft, a facility for teaching, and a dedication to passing on the tradition. 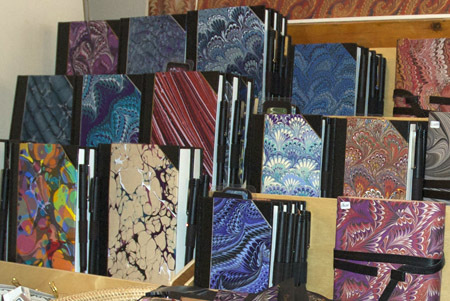 It’s our good fortune that they will be demonstrating marbling at the 2014 Lowell Folk Festival, where the theme of the craft area will be paper traditions. Bread may be the staff of life, but fried dough is its treat. Fried dough is often associated with summer fairs and carnivals, where it’s made in vats of hot oil. But this seemingly generic food has roots in many cultures. Varieties of fried dough made in local home kitchens are part of the foodways of cooks with African-American, Greek, Italian, Polish, and Portuguese roots. Fried breads are made with yeast dough or flour, which is shaped and transformed by frying. 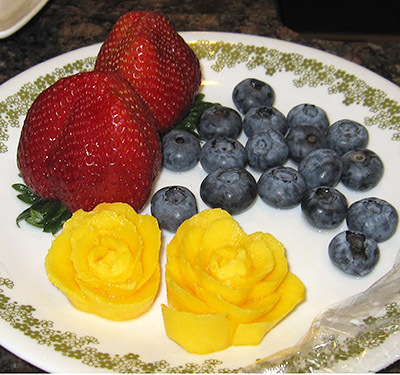 Frequently the small, often bite-sized confection is finished off by being rolled in toppings such as honey, sugar, cinnamon, or the sweeteners are sprinkled on top. There’s no such thing as leftovers where fried dough is served! Come to Foodways Tent this July’s Lowell Folk Festival and you’ll have a chance to see and taste five different versions of fried dough. Author Heritage8Posted on June 21, 2013 July 5, 2013 Categories Annual celebrations, Festivals, Foodways, UncategorizedTags fried dough, Greek loukamathes, hoeckes, hush puppies, Italian pizza fritta, loukomathes, Plish chrusciki, Portuguese filhoses, Portuguese malassadasLeave a comment on Fried dough, anyone? For several years now, we’ve been trying to track down the Dominican carnival comparsa rumored to be based in Lawrence, Massachusetts. Having seen photos of these fantasic costumed masqueraders, we thought they would be a perfect fit for leading the parade opening the Lowell Folk Festival. Finally, success! 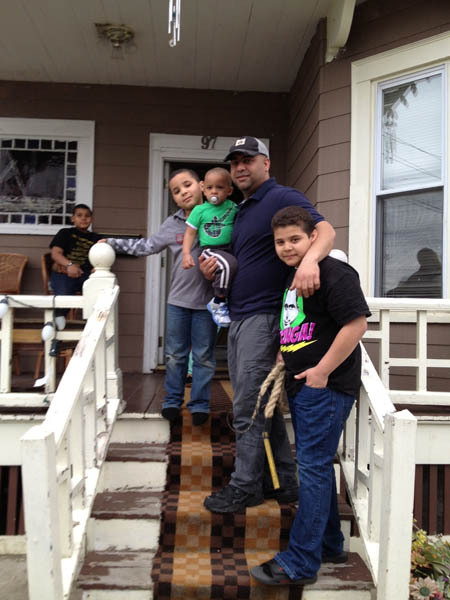 We recently visited with Stelvyn Mirabal, founder of the Asociación Carnavalesca de Massachusetts, in his home in Lawrence. 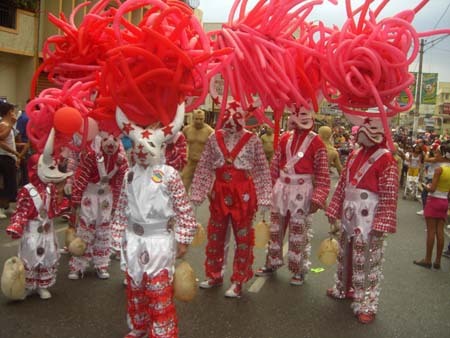 In the Dominican Republic, Carnival is celebrated during the whole month of February, where groups of elaboratively costumed people parading through the streets. 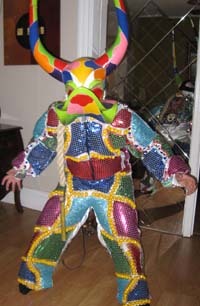 Some of the most famous of all the masked participants are the Diablos Cojuelos (limping devils). As the story is told, a demon was once banished to Earth because of his clownish pranks and was injured in his fall, hence the limp. Diablos cojuelos are multi-horned, sharp toothed beings. Many regions of the Dominican Republic have varying versions of this frightening devil. The Asociación Carnavalesca de Massachusetts brings a bit of Dominican Carnival to the United States. 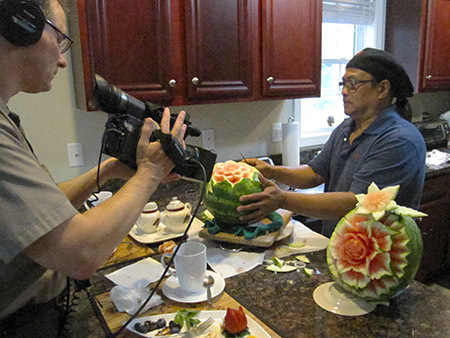 Twelve years ago, Stelyn Mirabal saw the need to preserve Dominican folkloric traditions in Lawrence, where there was (and is) a sizable Dominican population. He formed a comparsa (meaning a group of costumed people who participate in the carnival parade) to take part in Lawrence’s 2nd Dominican Parade. In 2006, he decided to go bigger and brought back 16 masks at the same time. Currently, there are 75 people in his comparsa. Stelvyn’s home city of Santiago Los Caballeros is known for its style of masks, which are called lechones (meaning pig). They are considered tradicional costumes and are relatively simple; the masks represent pigs or ducks. 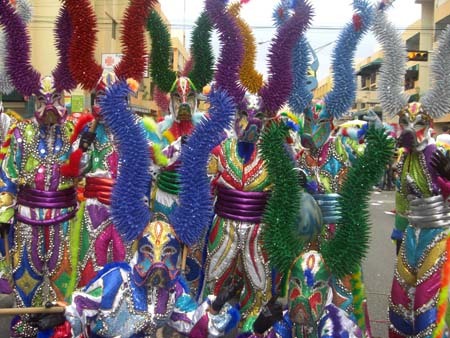 Suits from the city of La Vega are larger and more elaborate and are referred to as fantasía. 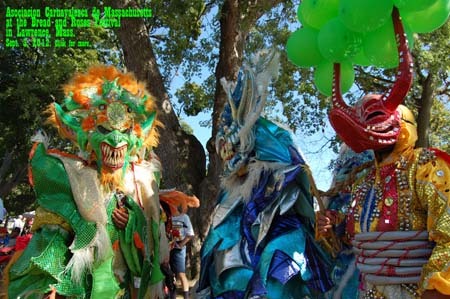 The lechones play the role of vejigantes, those who protect the people in the carnival, who, at one time, were members of the royalty. Vejigantes carry and swing inflated cow bladders to keep the crowd away from the parading comparsas. Here in the United States, the cow bladders have been replaced by colorful balloons. It was Stelvyn’s uncle who taught him and his cousins the carnival traditions of mask making and parading. At age 42, carnival has become a family affair for Stelvyn, “In fact, my mother and my sister, they all dress up. . . My father, a tailor, he used to make the suits.” Below is a photo of Stelvyn’s son Leonardo dressed in a fancy suit and wearing a lechone mask. Leonardo has also become an expert at cracking the whip. 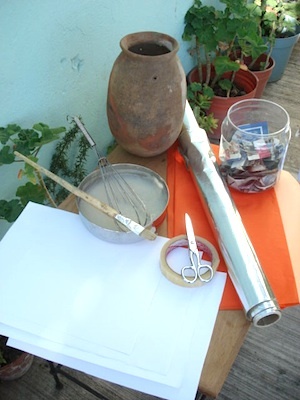 The masks are made from a mold of clay and covered with a paste like papier-mâché. The masks are shined, painted, and decorated. 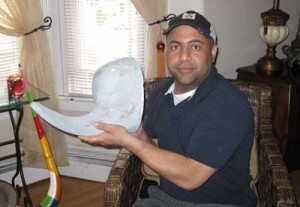 Although Stelvyn knows how to make the molds and papier-mâché masks, he prefers to import them from the Dominican Republic. The more elaborate diablos cojuelos costumes are professionally made using real teeth, horns, and skins, mainly of cows. The Asociación has more diablos cojuelos than lechones because to be a lechone, one has to know how to crack the whip and dance. 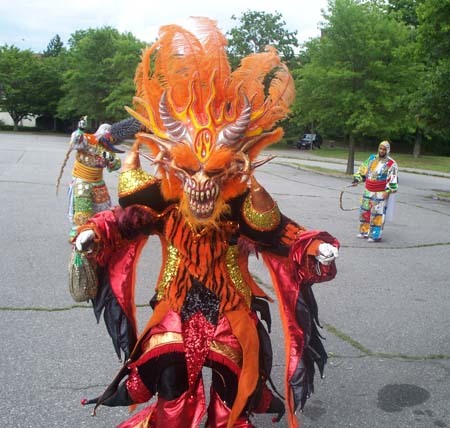 Today, the Asociación Carnavalesca de Massachusetts is well known throughout New England for their participation in Dominican and Latino cultural festivals and parades as ambassadors of Dominican culture. You will have a chance to see this spectacular entourage by attending this year’s Lowell Folk Festival. The Asociación Carnavalesca de Massachusetts will be leading the parade on by Friday and Saturday evening of the festival.